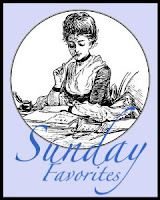 Chari at Happy to Design is hosting Sunday Favorites and it is always a great place to visit. Join in and show us a post from the past in case we missed it or have forgotten all about it. This one is from last August. What great fun it was to see everybody's rooster collections. There is a rooster party going on at Bella Vista hosted by Barb. This is such a popular theme because there is just something about roosters that seem to draw us all in. I didn't intend to collect roosters and in fact I don't. I just seem to end up with a lot of them. The large picture here was painted by me. It is part of a vegetable storage bin. The chicken wire is actually painted on. Now starting at the top smaller photos there is my doorstop, utensil jar, jug from Portugal, kitchen hook, plate, S&P shakers and double hook. This painting was done by the friend of the lady at a local apple orchard. It was in their store. When I asked if it was for sale she hesitated and he said YES. I felt really uncomfortable buying it as she seemed to not want to part with it. Smaller pictures are from the top, bucket, wood carving, wire roosters, Betty Crocker dishes, utensil jar, plate and shelf. I do have a few more rooster items but thought of them after I was done with these. I guess they have just become part of the household and I don't notice them all the time. You have quite a collection of roosters! They are fun to tuck here and there around the house, I have quite a few myself! But no original art,and I love your hooks! Very nice, thanks for sharing since I missed this the first time! You did a fabulous job painting that picture. That looked like real chicken wire. Really neat. Love seeing your collection. wow you're a good painter~!. I too am waiting with baited breath and rapt anticipation for Barbs Roo party. Love the wine cork wreath! I put the link up on my facebook so my sis can see. Thanks!! You have lots of fun rooster items. It is surprising how sometimes we don't even realize we have this or that still hanging around. they jsut become part of our home. 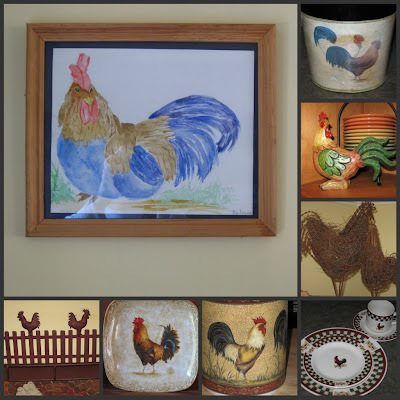 Hi, I had roosters and when I redid my kitchen I gave quite a few away along with some lovely wall art to my daughter. I recently bought three roosters, rooster plates, another set of roosters along with a rooster teapot. So funny, rooster, rooster, rooster. Oooh...loved this post! Lori, I didn't know you were such a talented artist/painter! 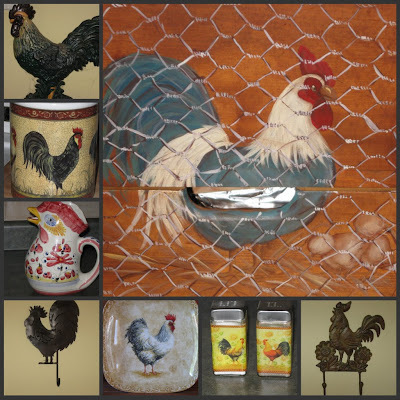 I love your rooster painting and the chicken wire is fabulous too! Wowzer!!! You are really good, Girl!!! Thank you so much for sharing your rooster collection with us for Sunday Favorites this week, my friend! I loved it!!! Oh yes, and I love the Betty Crocker dishes too...sooo adorable! Have a marvelous Monday, Lori!